Whether Hospital Accreditation Has Led to Improvement of Care Quality in Iran or not? The most important mission of hospitals is to provide appropriate and high quality care for patients. Different methods and models have been used to assess the quality of care. One conventional model used recently in many countries is the accreditation model which has been efficient in developing structural, process, and outcome standards. Accreditation is a systematic process carried out based on predetermined standards for evaluating the performance of hospitals.1,2 With the recent implementation of the hospital accreditation model in Iran, whether the accreditation has improved the quality of care is under question. Since its implementation, several studies in many countries have investigated the accreditation program and its related issues; however, there is too little evidence to make a general conclusion, and more studies are necessary. There are many contradictions in the experts’ opinions of the accreditation and financial and organizational effects, program evaluation, and measurement of quality. Greenfield conducted a systematic review on accreditation and came to the conclusion that, although accreditation has currently been accepted as an essential element in improving quality of care in many parts of the world, the evidence supporting it is insufficient. Many countries have studied this issue and found no evidence for the effect of accreditation on improving quality or the evaluation of the effectiveness of the system or the various methods of implementing the program.3 The fact is that there is too little evidence to judge in the world, and the situation is the same for Iran. It is still not possible to answer the question of whether accreditation leads to improved quality of care. The various aspects of accreditation must be assessed by studies in Iran so that it can be judged correctly. • Assessment of the accreditation program from the viewpoint of health experts. 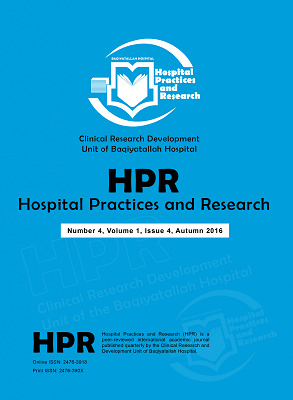 Bahadori M, Teymourzadeh E, Ravangard R, Alimohammadzadeh K. Responses to the criticisms about “The accreditation of hospitals in Iran.” Iran J Public Health. 2016;45(6):840-842. Bahadori M, Ravangard R, Alimohammadzadeh K. The accreditation of hospitals in Iran. Iran J Public Health. 2015;44(2):295-2956. Greenfield D, Braithwaite J. Health sector accreditation research: a systematic review. Int J Qual Health Care. 2008;20(3):172-183. doi:10.1093/intqhc/mzn005.